While I think that when we say “gaming” these days, our mind moves right to some technology — either a mobile device or a console or a computer — we want to start off our Gaming Camp next week away from the computers. So, using an idea from a workshop I attended, we are going to divide the students up into small groups, give them a bag of “supplies” and let them design their own game. It could be a board game. It could be whatever they want. I had fun going through the arts and crafts store, thinking of odds and ends that might be interesting for students to use in this activity. 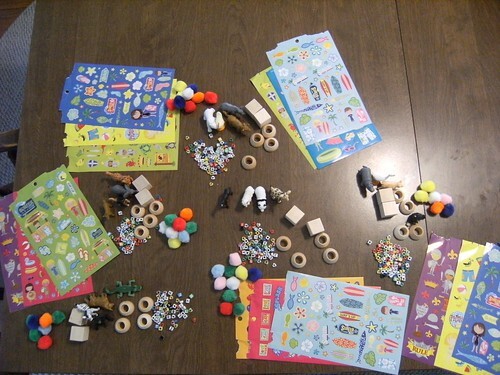 I ended up with pom-poms, a bag of small letters (for braiding), stickers, wooden blocks and circles, and plastic animals — plus some oversized stiff paper, if they decide they do want to do a board game. I also have some paper for them to write out the rules for playing their games. That expository writing is part of the activity. I gave extra materials to my six year old son, who immediately began using them for his own “game” that somehow involved animals surfing from one spot to another, avoiding creatures (such as the pom-poms). So, at least, I know this activity can be done, with a little imagination. And really, this is to set the stage for when we do move to the computer. The reflective practice of what makes a good game and what (if any) limits there should be for the player will come in handy when they do start designing their own games at our online site and possibly with Scratch. The offline activity will also get them working with each as a collaborative group, and we want that bonding to happen so that they can then help each other with feedback later on. One of many things I am liking about Gamestar Mechanic is that it gives you various pieces of data around the games that you create and publish within its community. The other day, I created my first multi-level game — Deep Drop Dream — and over the last three days, a few players have given it a try. As a Premium member, I have access to various stats (see above) which indicate to me not only how many people have played it, but also, whether they were able to finish the game or if there was a level that was abandoned consistently. If a game is too hard, then the player gets frustrated. If it is too easy, they get bored. The key to game development is to find that middle ground where there is challenge for the player but no insurmountable challenge. They have to be able to succeed, although it may mean they have to work at it. This data chart shows where those kinks in the game might be, and for the developer, you don’t always get that sense. It’s like writing a novel — sure, it reads great to me, the writer, but an impartial reader can give valuable critical advice for places where the story doesn’t work. Here, I notice that 15 players started the game but only four finished. A few dropped out at different levels, and according to the guidelines, the funnel’s data shape is fine. It’s OK to lose some players. But if everyone is gone — if the funnel has a sharp tip at the end because no one made it there — then you know you have trouble and need to revamp the game. 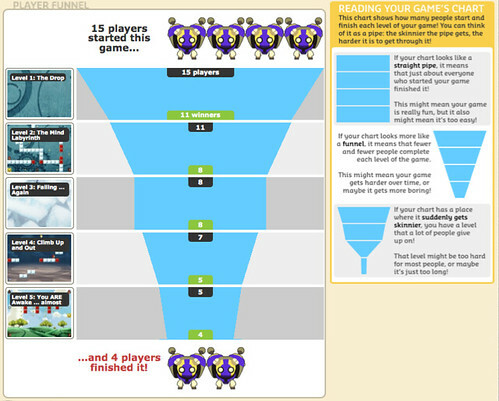 If the funnel is a vertical rectangle, meaning every player won every time, then the game is too easy. This is a great analysis tool for kids, don’t you think? I had long heard about this documentary (The King of Kong: A Fistful of Quarters) and its look nto the world of competitive video gaming (yes, there is a world of competitive video gaming). But it’s not something my wife would ever be interested in, so it lived just outside of my spectrum as a video that I might someday rent. The upcoming summer camp around gaming gave me the opportunity and the excuse to buy the documentary, which centers around a competition to get the highest score on the classic Donkey Kong arcade game, and I was able to watch it while my wife is out of town. My two older sons plunked down on the couch with me, too, and it was interesting to listen to their comments. Their main reaction: What kind of adult spend their time on a Donkey Kong machine in their garage, trying to earn a top score on an old arcade game? Dork! I tried to explain that everyone has certain obsessions, and for these people, it is playing the game that catapulted video games into the public consciousness in the early days. Donkey Kong was a game changer, if you will excuse the corner turn of words, in that suddenly, a game was very challenging and also had a story (Mario has to rescue the princess, who has been taken captive each level by that maniacal gorilla). And it was the game where Mario got his start, which later led to the Mario Brothers franchise, and I reminded them we have a Super Mario Brothers game on our Wii. I also gave them some stats about who plays video games, and how the demographics show that most gamers are in their upper 20s or 30s. Their reaction? That’s because games today are cool, and not lame. I told them that 20 years from now, our games will look lame, too, so it is all historic perspective. That quieted them down for a bit. Still, the movie is a fascinating look at an insular world where passion and focus and even good-versus-bad is on full display as a nice guy from Washington (Steve) tries to dethrone the reining champion (Jimmy), a pompous jerk who may or may not have cheated when he realized his top score was under attack (the boys and I were pretty clear that the dude had cheated, and it was at that moment of realization that the three of us were fully invested in the documentary, which shows the power of protagonist/antagonist even in documentaries — we suddenly had someone to cheer for and someone to jeer at). And in the end, just like any movie worth its salt, the good guy finally wins. Eventually. What I found fascinating was the pure passion for video games. Sure, my sons called them “nerds” and the movie both pokes fun at the crowds of people descending on video game arcades for championship weekends even as it celebrates the way they emerge as dedicated to their craft, as much as sports athletes do. I mean, just think of someone who spends hours each day putting a ball through a hoop. Again and again. That’s pretty idiotic on the surface, right? So how is that different than pushing a joystick around? I recommend The King of Kong for an entertaining and probing look at players in the aging video game world, back when arcades were community gathering spaces for gamers (unlike today, when we are shut up in our homes or immersed in online gaming communities). It is a powerful documentary about people, and the lengths they will go to become recognized for a single achievement and then, the things they will do to remain in the spotlight for fear of fading glory. At our upcoming gaming camp, we want to try to expose our kids to more than just Gamestar Mechanic, so we are going to dip our toes briefly into Scratch — the programming language from MIT that resembles a Lego set for animation. It’s not all that great for game design, per se, but it does show the backbone of how things are done on the screen by programmers. Gaming Reflection 7: Inside Scratch from Mr. Hodgson on Vimeo. Gaming Reflection 6: Designing and Playing a Game from Mr. Hodgson on Vimeo. Gaming Reflection 5: Game Design with Gamestar Mechanic from Mr. Hodgson on Vimeo. I’ve been trying to formulate a good plan for the middle school kids coming into our Game Design Camp. I’d like it to a combination of hands-on collaborative work along with diving into the computer, with some discussions and reflective practice thrown in for good measure. Gaming Reflection 4: Curriculum Ideas from Mr. Hodgson on Vimeo. PS — You can also view the other parts of my video reflections. I continue to share out some thinking about gaming for the classroom (or in my case, for a summer camp program). You can view part one and part two, if you want. Here, I chat about some of the resources I will be using to think about gaming possibilities and to bring into the camp for the kids to experience. My hope is to bring them away from the games from time to time to remind them of the bigger picture and larger possibilities of gaming as a media experience. Gaming Reflection 3: Resources from Mr. Hodgson on Vimeo. I stumbled on this at Vimeo, and was completely shaken by the stories starting to unfold in this upcoming documentary. You know, bullying took on a lot of weight this year in our schools — more than usual, thanks to a new state law mandating reporting and intervention — and I feel at times that the students began tuning it out because the concept was so prevalent. But what does impact them are personal stories of kids, and adults reacting, and I think this video documentary might have some good potential for making a difference. The Bully Project Promo from Lee Hirsch on Vimeo. This year, over 18 million American kids will be bullied, making it the most common form of violence young people in the U.S. experience. Directed by Sundance- and Emmy-award winning filmmaker, Lee Hirsch, The Bully Project is a beautifully cinematic, character-driven documentary—at its heart are those with the most at stake and whose stories each represent a different facet of this bullying crisis. Following five kids and families over the course of a school year, the film confronts bullying’s most tragic outcomes, including the stories of two families who’ve lost children to suicide and a mother who waits to learn the fate of her 14 –year-old daughter, incarcerated after bringing a gun on her school bus. With rare access to the Sioux City Community School District, the film also gives an intimate glimpse into school busses, classrooms, cafeterias and even principles offices, offering insight into the often-cruel world of children, as teachers, administrators and parents struggle to find answers. While the stories examine the dire consequences of bullying, they also give testimony to the courage and strength of the victims of bullying and seek to inspire real changes in the way we deal with bullying as parents, teachers, children, and in society as a whole. Through the power of these stories, The Bully Project aims to be a catalyst for change and to turn the tide on an epidemic of violence that has touched every community in the United States—and far beyond. Gaming Reflection 2: Why Gaming? from Mr. Hodgson on Vimeo.